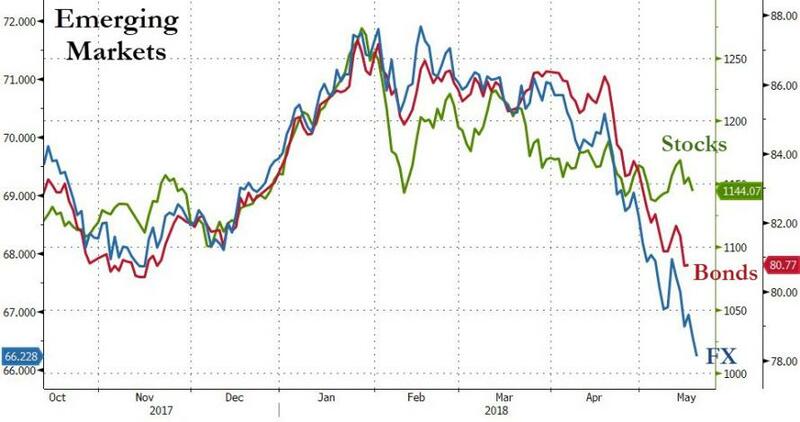 ... which led to an immediate tightening in financial conditions both domestically and around the globe, and which has - at least initially - manifested itself in a sharp repricing of emerging market risk, resulting in a plunge EM currencies, bonds and stocks. Adding to the market response, this violent move took place at the same time as geopolitical fears about Iran oil exports amid concerns about a new war in the middle east and Trump's nuclear deal pullout, sent oil soaring - with Brent rising above $80 this week for the first time since 2014 - a move which is counterintuitive in the context of the sharply stronger dollar, and which has resulted in even tighter financial conditions across the globe, but especially for emerging market importers of oil. 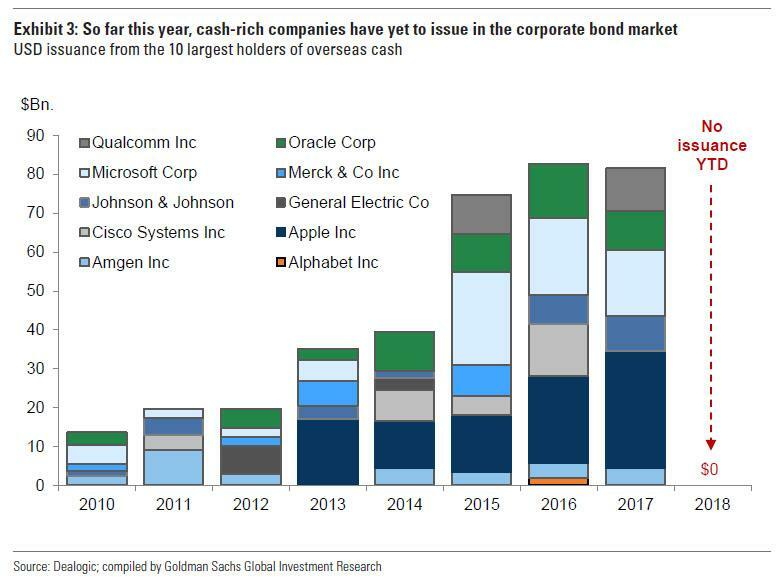 Meanwhile, all this is playing out in the context of a world where the Fed continues to shrink its balance sheet - a public sector "Quantitative Tightening (QT)" - further tightening monetary conditions (i.e., shrinking the global dollar supply amid growing demand), even as high grade US corporate bond issuance has dropped off a cliff for cash-rich companies which now opt to repatriate cash instead of issuing domestic bonds, with the resulting private sector deleveraging, or "private sector QT", further exacerbating tighter monetary conditions and the growing dollar shortage (resulting in an even higher dollar). And while the latest incarnation of the dollar's "impossible trilemma" - rising dollar, rising oil, rising yields (not to be confused with its more conventional Chinese variant) makes a short, if perplexing appearance, ultimately it's all about the value of the dollar, and its impact on downstream assets and volatility. For Kocic, the relative strength of the dollar is the exogenous event that could awake markets from their peaceful slumber, resulting in a violent reassessment of monetary conditions as the Fed quietly undoes the biggest monetary experiment in history, or as he puts it, "although unwind of stimulus and Fed exit continue without disrupting the markets, the underlying stability remains local, threatened potentially by the tail risk." For now, the DB strategist notes, "the current market configuration appears to be cooperating with the Fed’s efforts in either scenario" and "market positioning and flows are likely to cause offsetting pressure to each macro risk and therefore help stability of the system." 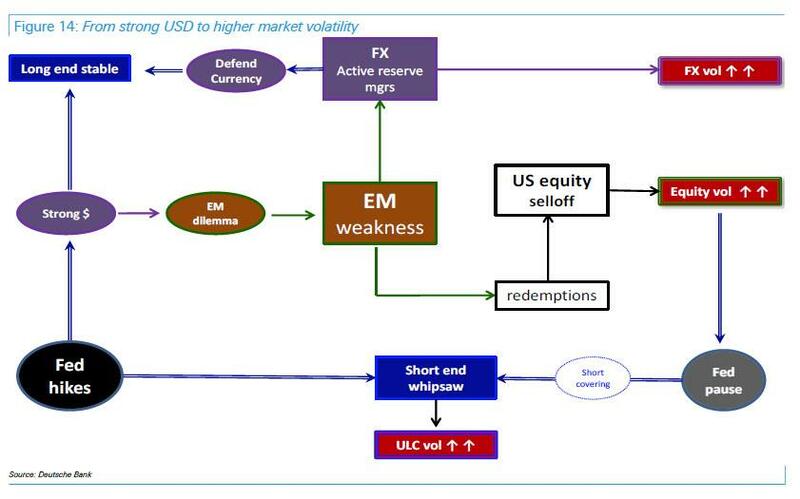 In particular, strong USD, which is bullish for bonds, in terms of global sponsorship, is also bearish for EM currencies and reserve managers there are likely to defend local currencies by selling US assets, which goes against macro. Similarly, their response to weaker USD would stabilize bear steepeners on the back of defending their exports through stabilization of EM currencies and support for the US long end. The bigger problem, one discussed by Kocic previously, and which also takes the shape of the yield curve in consideration, is that with every passing day of normalization manifesting itself in bear flatteners, the market gets closer to the tipping point of duration decrease in which a rotation from risk assets into the short-end of the curve threatens a forced "price discovery" of the new "Fed put" (which Kocic recently calculated was in the 2,300-2,400 range). So in this context of a creeping bear flattener, Kocic observes that together with the stronger USD, these two discrete trends have a potential to create more volatility and discomfort across all market sectors than bear steepeners if they both remain localized and do not trigger tail risk. An example is the 2015 episode where asset managers faced redemptions due to EM losses and had to sell the best performing assets (US equities) to cover those costs. This means more turbulence in developed markets and possible tightening of financial conditions, which could question the strength of the USD and possibly push Fed to take a pause. 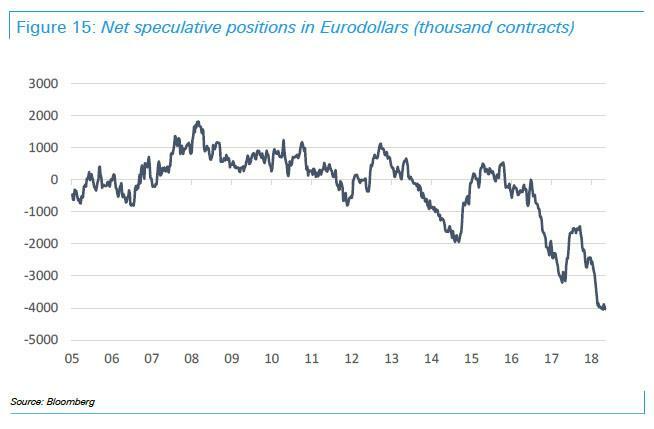 Given record shorts on the Eurodollar curve (Figure), Fed pause is likely to trigger unwind of these position which could be explosive and the front end of the curve could rally hard. The EPFR data reflecting the ETF and Mutual Funds Flows show continued outflows from the emerging markets and inflows into the short end of the UST curve, which is only increasing the stress in this sector. So, although we should see continued stability at the long end of the curve due to offsetting pressures between macro and flows, a slow grind of the front end, if persists, could morph into a volatile whipsaw. Further strength in the USD and the front end sell off on the back of more hawkish Fed could be potentially bearish for risk assets and act as a trigger for rates reversal. 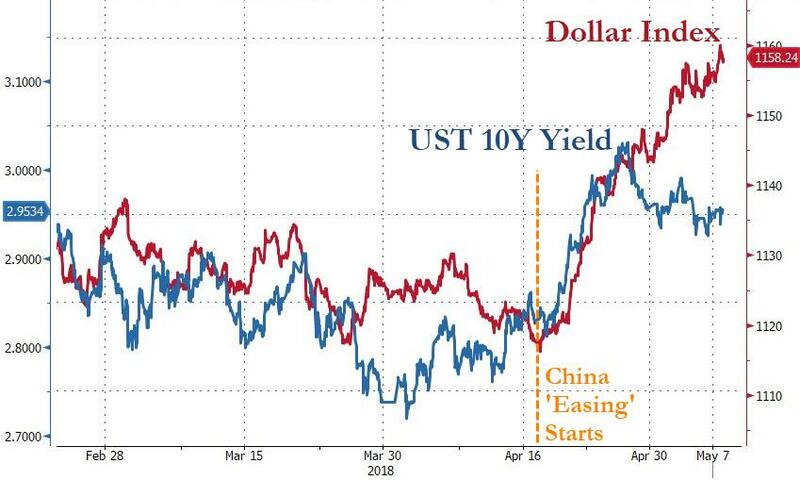 In short, while the Fed has found itself trapped before, it was only the recent spike in the dollar (thanks China) that has forced the Fed to act, with either decision - either further hawkishness or a dovish relent - leading to major market pain. And the longer the Fed delays making the key decision, the more painful the outcome will eventually be.